Be the first to share your favorite memory, photo or story of Royce . This memorial page is dedicated for family, friends and future generations to celebrate the life of their loved one. 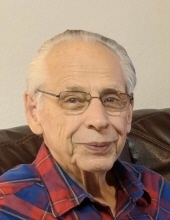 Royce E. Straub, 81, of Beatrice passed away at the Beatrice Community Hospital on Saturday, April 6, 2019. Born on May 5, 1937 in New Columbia, Pennsylvania, Roy grew up along the banks of the Susquehanna River. He loved competing in sports, and was a member of the town of Milton Little League, which competed in the first Little League Baseball championship tournament hosted in Williamsport, PA. Roy graduated from Milton High School in 1955 near the top of his class, and shortly thereafter joined the Air Force. He served in Lincoln, NE as well as at Shemya Air Force Base, which is off the Alaskan coast. Although Roy rarely spoke of his responsibilities in military intelligence, he did share how he was tasked with intercepting Russian communications during a critical time of the Cold War. He was awarded the Good Conduct Medal for exemplary behavior, efficiency, and fidelity. After the service, Roy married the love of his life, LaVae Pohlman of rural DeWitt on December 1, 1963, and they were married for more than 55 years. Immediately after their wedding, they packed up all their belongings in Roy’s car and drove to California to begin a new life together. Everything Roy did was rooted in his strong faith and he believed firmly in letting the Lord help guide his path. Roy’s banking career began at Valley National Bank in Glendale, CA where he served from 1964–1977. Named a bank officer in 1971, Roy was later also named as Vice President and Manager. In 1974 he graduated from Seattle’s Pacific Coast Banking School. His graduation thesis was honored and remains today as published in the University of Washington Library. Roy helped his California community as a member of the JayCees and Kiwanis Club where he also served as president from 1976–1977 and received the Kiwanis Key Award. Ready to leave the world of corporate banking behind, Roy and LaVae moved back to the family farm in DeWitt, Nebraska in 1977, where they remained for the next 34 years. Roy worked for Security First Insurance based out of the Bank of Clatonia for 32 years, from 1987 to 2010. He worked at the bank five mornings a week until noon, and then headed home, changed into his “work” clothes, and went out to the field. He was an inspiration to his family as he worked tirelessly, but always returned home with a good attitude, a smile, and some stories to tell. Roy was thrilled to work the land and raise livestock as he did in his Pennsylvania youth, using the opportunity to teach his children about a whole new world beyond big city living. His love of both banking and farming provided him with a tremendous diversity that kept him young and active. He worked hard, but also loved his social time with friends and neighbors, enjoying things like the bowling league, square-dance club, card club, senior diners, and coffee in Clatonia. After 34 years of farm life, Roy and LaVae moved to Beatrice in 2012 to focus more on their passions, which included traveling and spending time with their children and grandchildren. They traveled across the country to watch their grandchildren at their sporting events, recitals, school plays, confirmations, graduations, school functions and weddings. When home, they enjoyed clipping coupons together for the needy, where they collected in excess of $100,000 in savings for the Lincoln City Mission. They also loved to camp and do cross-country road trips. Roy declared he had been in every state except Hawaii, only because he couldn’t drive there. He loved to tell stories of the sights they’d seen and had an uncanny ability to relay specific facts and statistics years later. With just a passing glance, Roy also had an incredible talent for naming the year, make, and model of any vehicle made between 1950 and 1970…and he never got it wrong. Let it be said that the two most important things for Roy were his love of the Lord and his family. He often read his Bible in the mornings, which he went through from cover-to-cover on numerous occasions. He was a member of St. Paul’s Lutheran Church in rural DeWitt, served as council President and held numerous other council positions. For Roy, Sunday was the Lord’s Day and he refused to work, choosing instead to invest his time with his family. Funeral services will be held at 10:30 AM on Saturday, April 13, 2019 at St. Paul’s Lutheran Church (Soap Creek) of rural DeWitt with Pastor Rick Johnson officiating. A family prayer service will be held at 10:10 AM Saturday in the fellowship room of the church. Burial will be at the St. Paul’s Lutheran Church Cemetery with military rites conducted by Hawes-Wood American Legion Post #212 of DeWitt. The body will lie in state at Fox Funeral Home on Friday from 10:00 AM to 8:00 PM with a family meet-and-greet from 6:00 PM to 7:30 PM. Visitation will continue at the church one hour prior to the service on Saturday. A memorial has been established to St. Paul’s Memorial Fund or families’ choice with Richard Rohe and Alan Holsing in charge: www.foxfuneralhome.net Arrangements are entrusted to Fox Funeral Home of Beatrice. To send flowers or a remembrance gift to the family of Royce E. "Roy" Straub, please visit our Tribute Store. "Email Address" would like to share the life celebration of Royce E. "Roy" Straub. Click on the "link" to go to share a favorite memory or leave a condolence message for the family.